I love the back of this card. That said, I’m not quite sure that being able to “hit like crazy, run well, swallow up everything in right field (and where was Anna Benson?) and throw 90-mph-plus” is unique to Markakis. Although it should be noted that he was viewed as much as a pitching prospect as a hitter…and was drafted two times before being selected #7 overall by the Orioles in 2003. While chin balancing is not unique (I have a friend who can balance almost anything as well, although he specializes in lacrosse sticks), it’s cool. In the grand scheme of things Markakis appears to be a down to earth guy who loves playing baseball and goofing around. The fact that he wanted to share the chin balancing factoid on his 2010 Topps card makes me like him a lot more – anytime I see players being “kids” or at least normal (and not approaching the game like a job, even though it is) warms my heart like apple pie a la mode. There’s something wholly sweet and honest about it, and I give kudos to Markakis for it. 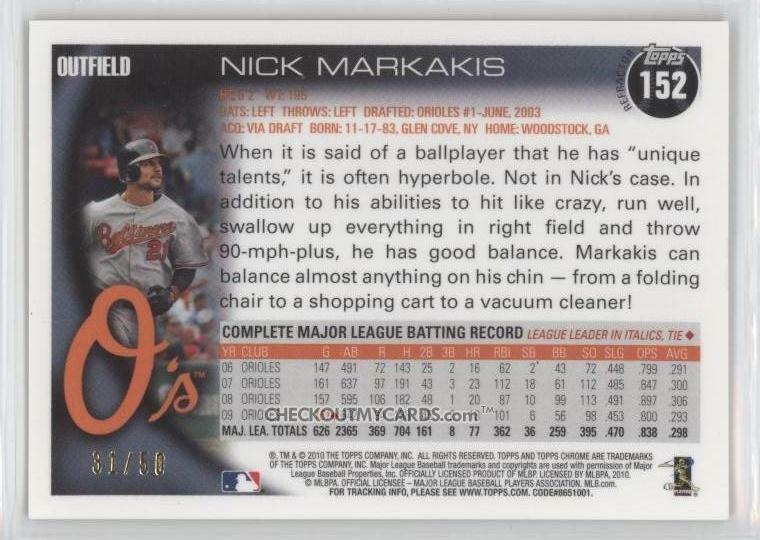 Outside of the above, I have a hard time thinking/writing about Markakis – and it took awhile to write the above and even select this card for Flip Side inclusion. Quite simply, I’ve expected so much of him given his early success and high draft pedigree that his plateau has left me disenchanted. On the other hand, he’s a great teammate and a phenomenal person – he and his wife have truly embraced Maryland (my home state) and really give back. Since reaching the majors in 2006 at 22, Markakis has been a full time player. In his second full season he would hit 23 HRs, steal 18/24 bases and post a .300/.362/.485 line. He’d follow that up with arguably his best year (20 HRs and a .306/.406/.491 line). Clearly his 2008 (5.5 WAR) during which he walked 99 times would be the turning point in his career. Right? Well, I hope not. Since 2008, Markakis’ slugging has dropped off significantly and he isn’t walking as much as one would like. Still, we must remember that Markakis will only be 27 during the 2011 season. I think people (especially myself) have expected too much too fast of Markakis. He does own a .298/.368/.463 line in five full seasons with 89 HRs and has accumulated 18.3 WAR. For comparison sake, Carl Yastrzemski, by age 26, had played six relatively full seasons. Entering his age 27th season, Yaz had a .293/.373/.458 line with 95 HRs. Yaz had been worth 21.2 WAR at this point. At 26, Yaz hit 16 HRs. At 26, Markakis hit 12 HRs. At 27, Yaz hit 44 and would average 37 a year for the next four seasons. I’m not saying Markakis will be Yaz, I’m just saying that the book isn’t closed on Markakis.